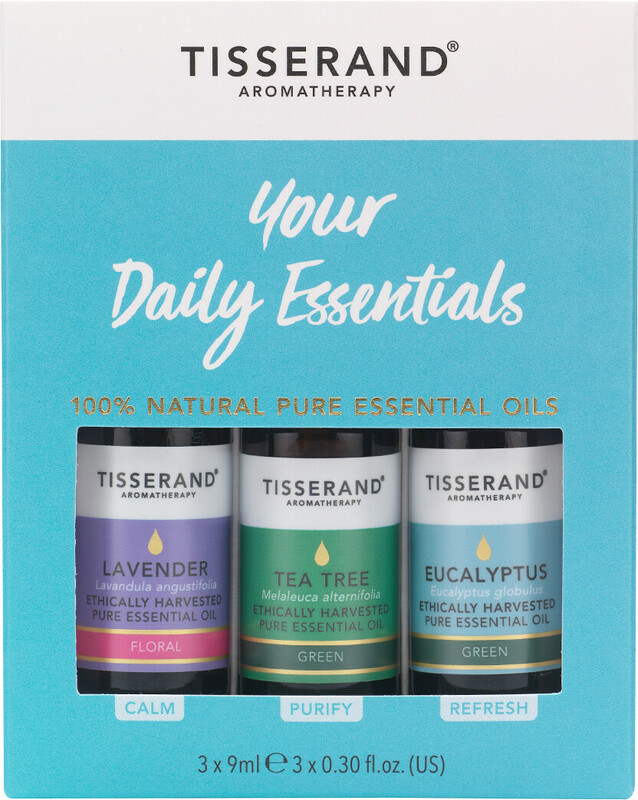 The Tisserand Aromatherapy Your Daily Essentials Kit presents a selection of daily-use oils to kick-start your aromatherapy collection. 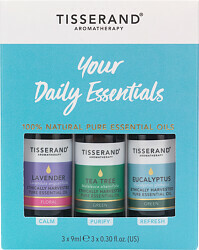 Three of Tisserand’s all-time bestsellers in one practical kit. These 100% natural, versatile oils are ideal for a multitude of uses around the home, from scenting the air to rounding out your first aid kit. These oils can be used by all the family, including children aged 5+. Tea Tree Essential Oil 9ml: A powerful and bracing aroma distilled from the leaves of trees in Australia. Use neat to accelerate the healing of bites, wounds and cuts. Eucalyptus Essential Oil 9ml: A strong and fresh aroma crafted from leaves grown in Spain. Use in a vaporiser to refresh the air. Lavender Essential Oil 9ml: A light, fresh and clean aroma created from flowers grown in France. Use neat on the skin to cleanse and soothe.